Having a potty trained child is wonderful. Actually potty training a child, however, is much less so. Oh, the mess and the stress! I mean, let’s face it–bodily fluids are pretty much the last thing over which you want to have a battle of wills with your toddler. Which is worse: cleaning up messy diapers indefinitely or cleaning up a potty seat until your kiddo can do it on her own? And yet, that’s where I found myself as we began the process of moving my daughter out of diapers and into big girl underwear. A relatively easy baby, she became a full-blown terror almost immediately after I got pregnant with her little brother (of course). Everything was a struggle with her (and still is, but that’s a story for another time). 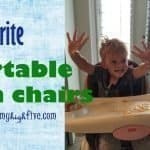 I knew potty training could be difficult with even the most easy-going child, so I researched. I researched like I was getting a PhD in potty training. What Are the Potty Options? When it comes to your child actually using the bathroom, there are two main options to choose from. Do you want your child to go straight to the “big kid” toilet with a potty seat? Or would you rather start out using a separate toddler toilet before transitioning to the full-size one? As is always the way, each option has its pros and cons. 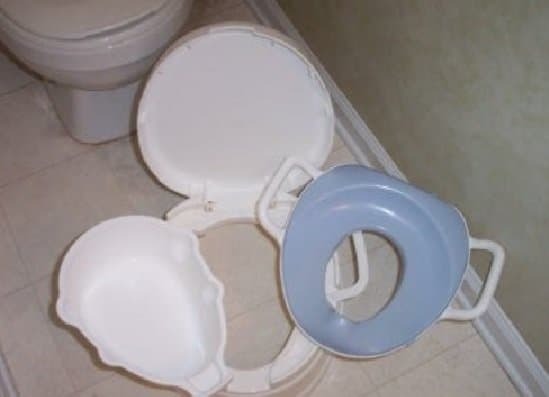 If you’re not interested in buying a separate potty for your toddler, you’ll need some sort of training seat to prevent them from falling in the toilet. Because that would definitely turn your kid off of potty training for a while! (Also, gross.) Starting your kid on a potty seat on the regular toilet allows you to skip the mini potty stage altogether, but it only works if your child feels safe! These products can help with that. It seems like there are about a million versions of the potty seat, and they’re all pretty similar. They all allow your child to sit on the “big” toilet. Potty seats are small and easy to take on the go. But the extra features on this seat make it stand out from the crowd. Plus it’s more affordable than the others! Made from contoured plastic designed to be both comfortable and secure, this seat also includes a non-skid, grippy edge to ensure that it will stay in place during use. Conveniently placed handles help your kid feel even more secure as they sit on a seat that is taller than they’re used to (and that has a hole in it). Included in the basic shape and design of the seat are two little “feet” that allow it to easily stand up on its own, making it easy to store out of the way. By far the best thing about this seat is the ladder. My daughter is very independent. She loved that she could climb up to the toilet and sit down by herself. No need for Mommy or Daddy to lift her up! At the top of the ladder are handles on each side for kids to hold on to. These handles provide them with that oh-so-necessary sense of security. And when your kid is done, the seat easily folds up to fit next to the toilet for later use. A step up–literally–from the basic potty seat model, this large version fits over most regular and elongated toilet seats. It’s also padded and incredibly comfortable. This is so important for toddlers, who can sometimes spend quite a long time sitting and waiting to go! My daughter loved using this, and it made our lives so much easier! 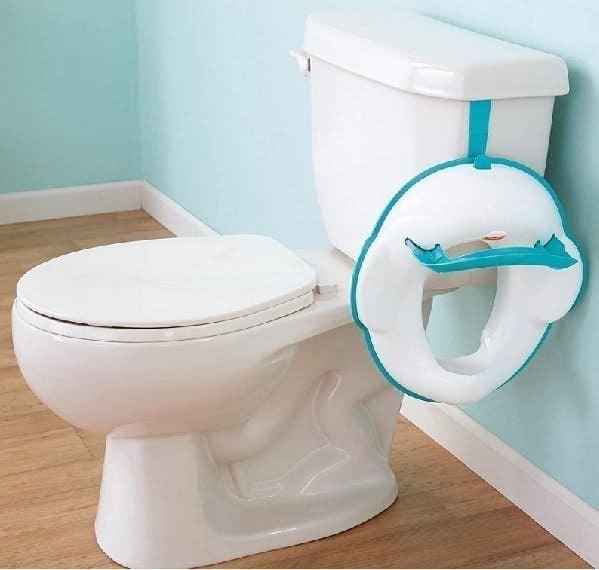 The Perfect Potty Ring is an adjustable potty seat that fits nearly every toilet. Adjust it to fit your toilet tightly so you can keep your child safe and make him feel secure. This seat is made of plastic. 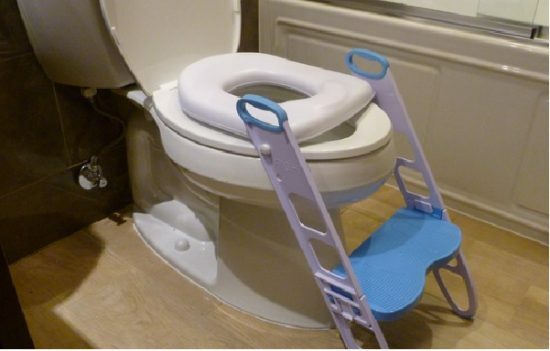 The handle on the back helps the seat attach and detach easily, and a hook allows you to hang the seat on the side of the toilet when not in use. The contoured plastic is comfortable to sit on, and handles on the side give your little one even more security. A toddler toilet is a good option for kids who are afraid of using the regular-size toilet and need a way to ease themselves into it. On the flip side, choosing this option can sometimes result in a second round of toilet training as you transition your kid to the regular toilet. Having a separate toddler toilet also takes up more floor space in your bathroom, so this may not be a good option if space is an issue. If you do opt for the separate training potty, you can choose from a variety of different types. At their most basic, these potties are a plastic seat with a hole in the middle. But as with anything, you can always upgrade to something fancier! For a very basic toddler toilet, you can’t beat this cute little seat. It’s by far the most affordable option, making it easy to buy one for each bathroom in your house–and maybe even one for grandma’s and grandpa’s house! It’s made from one solid piece of plastic, so there’s nowhere for bodily fluids to get trapped and cause a literal stink. Because of its smaller size, this potty is lightweight and easy to travel with. But just because it’s small doesn’t mean it’s flimsy! To the side of the bowl portion are softly curved, wide ledges to provide support and stability, and anti-slip material on the bottom will keep the potty securely in place as your child uses it. This potty looks and feels like a miniature toilet, which will make it easier for your child to transition to a regular toilet. It has a removable bowl that is easy to clean. On the back of the potty is a flushable wipe holder, which allows your little one to learn good hygiene practices early on. One of the most unique things about this product is that it comes with a flush handle that makes a flushing sound. Your child will love hearing the flushing sound after using this potty. 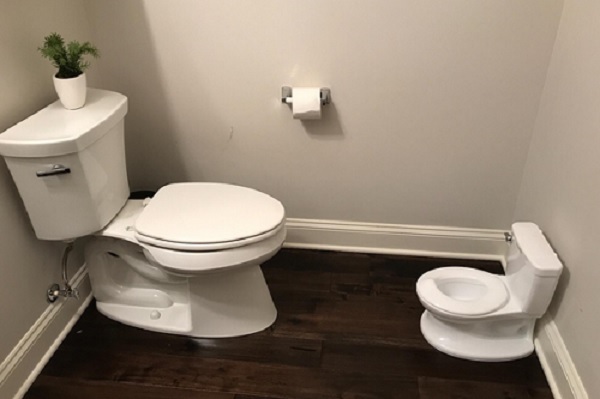 While this is a great option for young children, if you have an older child trying to potty train, this potty might be too small. If you’re looking for a potty that gives you the most flexibility, this is your best bet. It’s a separate small toilet, potty seat for the regular-size toilet, and step stool all in one. It’s a slight upgrade in that the training seat is soft rubber and boasts two handles for extra security. This also makes it a better option for traveling with the training seat. The entire potty has handles, which make it easier to transport from room to room. The design of the potty is one of the more attractive I’ve seen. Its white color allows it to blend in and not draw as much attention to itself. And best yet, the whole package includes potty training tips, stickers to use as potty decoration or rewards, and coupons for training pants. Long story short, the best deal for your money is likely to be the Primo 4-In-1 Soft Seat Toilet Trainer. It acts as both a separate toddler toilet and a potty seat. Additionally, it provides a few extra luxuries to make your child feel as safe and comfortable as possible. And whether your kid wants to ease into potty training with a mini toilet or head straight for the big one, you’ll be ready. 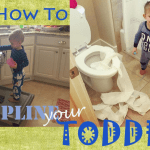 Not sure if your child is ready to potty train? Our potty training readiness article will tell you. Also read about our favorite potty training underwear. If you’re looking to reward your toddler for a job well done, check out best swim floaties for toddlers.